I used to build glass Dune Buggies. Then I learned to fly and built and restored a couple of airplanes. In 2008, I bought a JK wrangler, and a couple of years ago got the itch to turn it into a pickup, using the Brute style kits. The wife put a hard "NO!" on that one--something about "you're not cutting up a 30k truck and..." So I started hunting around for a project. I found an 82 CJ5 with lots of running gear goodies: 4.2 with 4Liter head, Mopar fuel injection, Ford T90, Dana 300, posi front, locker rear, forged axels, onboard air and welder--the guy said he had dropped 10 grand in the last 600 miles and handed me a box of receipts that actually totaled over 16. Although lots of parts were low miles, it had sat for a few years, and he had wheeled it hard on the Rubicon, and the body showed it. I paid $4500, drove it for a year around the ranch, and started collecting parts for a build. I found a CJ7 frame and tub for $150, and sold the tub for $125. Found a 1970 DJ 5 postal with title for $300. Sweet. Pre-smog Commiefornia title! And a neighbor dropped off a relatively straight, only painted once CJ 5 tub for $40 when he saw the growing pile of jeep crap in the driveway. So it was time to go to work. 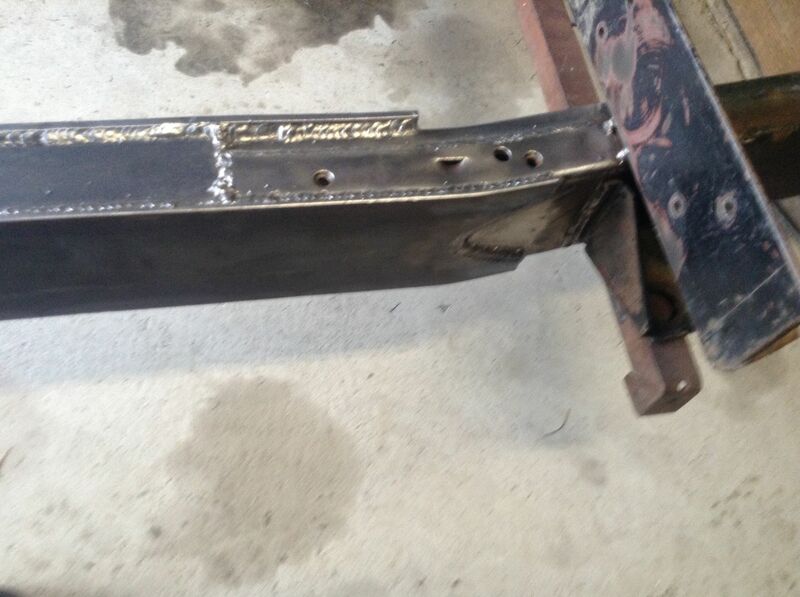 The CJ 7 frame was cut 6" in front of the forward rear spring mount, after tack welding angle iron across the top and bottom of the frame a foot in front of the cut location. I wanted a 3' stretch on the CJ5 , so that meant adding 2' to the CJ7 frame. I used 2X4 3/16 wall tube, 3' long and welded shim plate to the sides to fit inside the relatively straight 12" portion where I made the cut. The sides of the frame were rosette welded to the shimmed square tube inside, 3/16 plate welded to the top and bottom of each frame rail, and finally plate was welded and fish mouthed to the inner and outer frame rails. Heavy, overkill, but strong. Care was taken to keep level, plumb, and square. The good tub was cut 8" aft of the "step" in the tub, and the last 4" of body and 10" of roof was cut from the DJ 5. It will be grafted onto the CJ 5 tub to make the back wall of the pickup cab. I will use foam and fiberglass to make a removable hardtop to fit across the cab. I have a 52" shear and a 10' sheet metal brake from building airplanes, and I plan to bend up an old Willy's style truck bed roughly 5' long. Wish me luck folks! The frame building went well. This weekend we start welding the cab together. I plan on doing tube flattie style front fenders and am going for that old school look. I use image shack, upload med size pics, copy link. open the insert image icon in post quick reply ( two mountains with moon) paste your link and upload. Sounds like a great build! Angles tacked to hold position when cut. Plates welded all four sides and sleeved 6" in each frame half. I didn't fishplate the inner fram--we will see if the stress risers are bad enough to hurt it. your half way there, in image shack open pic you want to display, to the right open get links/resize images, copy link. in your post top header open insert image and paste your link to attach pic to your reply. Here is roughly how it will fit together. The character with the pick axe is a buddy helping with the project. Only dude in Northern California to be charged with felony evasion on a moped...lol. True story. I'll be working on the cut lines today where they will be welded together, and clearing out the fenderwells. I've got tube and sheet ordered for the bed and cab back--when it gets here it's off to the hangar to bend the bed sides. I'm gonna use the rear window from the rear door of the DJ. It's got a nice chunky look to it with the big round corners. I will also, when filling the sides and adding the door jamb material to the cab back, consider using part of the side of the rear cab for a tall oval plexiglass window, mirroring the curve that is already there. I was pulled over on moped in 1983 speeding and loud exhaust, 43 in 25. I was 16 at the time wrote up juvenile delinquent report and called my mother 12;15 am. I was driving by this cops apartment on my way home at night when he went on night work he waited for me to go by and pulled me over. I like where this build is going. I will follow along. So, the good news is the metal is in and I started cutting pieces. The bad news is the DJ cab back isn't going to work as well as I had hoped. Two problems, one, it was too wide at the top, and every attempt to section it and fair it into the windshield just looked "wrong." Two, I liked the blocky look, but the DJ has a taller span of metal above the windshield, and I didn't want to graft that on the CJ windshield frame. So I cut 22" out of the CJ tub and started grafting that onto the back. The benifit of that is using some of the stock ROP from two roll bars, and the ability to go with a bikini top if desired. Flat sheet going in, will get a little mor room to move the seat back. I like how the cab is coming along. This is almost exactly what I am planning with my 2A... eventually. Very cool! It looks good with the bed tucked in like that. I plan on that look for my rear fenders in tube. The bed sides will be at 50" and I will have that 45 degree bevel terminating in the toprail tube level with the jeep tub. I'm making my stake pockets and the angle support for the top tube out of 2" square tube. Not as pretty as the sculpted ones found on the Willys, but infinitely cheaper and easier to make. I will build in a little flare on the fenders to deal with the 35's, but I would love to find some stock looking steel wheels in 16's or 17's. They are pretty spendy--around $200 a pop for 16's. I'm just getting old, but that sounds like a lot of cash for a steel wheel! Some skinny mud tires would look real good on your concept. I will also have to fab some inner wheel wells in the bed. Not sure how that is going to work yet. Prolly just use the metal brake to bend 90 degrees and a return bend where the wheel well terminates at the side and floor. Might have to do a wood floor in the bed too. Definitely going to harvest the fat "Jeep" stamping on the back of the DJ to incorporate into the tailgate. These pics are old, should have some pics of the cut and bent sheet metal soon. I used Unistrut to mock up the size and location. I wanted the wheelbase to match my JK, which left me room for a 60" bed. If I was doing it again, I'd make it a little shorter, maybe six inches. Right now, the bed is centered on the rear axel, and sticks past the end of the frame by one inch. That part worked well. The bed pockets were welded from 2 X 2 steel, and the top rail is 2" round. I mite red the square 45 degrees.